Who is best putter in golf? Was Jack Nicklaus better on the greens than Tiger Woods and was Ben Crenshaw better than Luke Donald? The immediate problem with comparisons across the decades is that putting surfaces have improved so much that simply counting the number of putts players made or missed is an unfair comparison. Putting teacher Dave Pelz has conclusively proven that the quality of green surfaces has allowed players to putt better today than they ever did before. Today's top players all hole more putts than their predecessors 20 years ago, and they in turn holed more putts than players 40 years ago did. The other problem is that the stats can be misleading. Straightforward methods of measuring great putting performance aren't as clear cut as they seem. Easily the best putter of his day, the South African with the hook stroke first showed the world that putting could be an offensive weapon. Right up there with Tiger as possibly the best clutch putter in the history of the game. 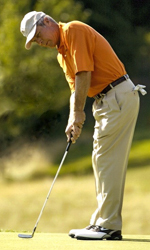 Jack's stroke was ugly, his "hit-putts-firm" method was brutal, but his mind was the strongest out there. Although his putting skill waned in his latter years, Watson seemed to go for much of the late 70s and early 80s without missing anything within 10 feet, and a lot of those putts won majors. By his own admission, Stockton wasn't a great ball striker, yet his putting won him two majors and millions of dollars on the senior tour. Now he's one of the world's leading putting teachers. If this award was only for beauty of stroke, Crenshaw would win hands down. No questions asked. If you were privileged enough to see Ben with his trademark blade putter, you probably saw the most natural putter the game has ever known. "The Fax" made his career out of being a great putter. He won 8 PGA Tour titles and came close to winning the 1995 PGA Championship, all without being, by his own admission, a great ball-striker. For three seasons, he led the PGA Tour stats (1996, 1999 & 2000) and holds the tour record for putts on Greens in regulation (1.704 putts per GIR), a stat which has now been superseded by Strokes Gained - Putting. Many people will say that Tiger's putting held him back from winning majors in the first few years after the personal scandal and injuries which rocked him in 2008-2009, and they'd be right. Just like Jack Nicklaus, though, Tiger would many people's nominee to hole a clutch putt under pressure. When the new PGA standard of Strokes Gained - Putting was first calculated in 2011, Donald was the season's leading performer. When the stats boys looked back at the 2010 and 2009 season they found out he'd topped those tables, too. During this time he also topped the European Tour's tables for putts taken on greens in regulation. How do you even begin to calculate who's the best putter? Total number putts per round, which used to be the standard putting stat, actually tells you just as much about how well a player hits their approach shots and short game shots, because players of all standards make more putts when they are putting from short distances. Peversely, total putts per round even favors people who miss greens in regulation, because short game shots end up much closer on average than full approach shots, so missing greens leads to easier putts. Counting the number of putts per green hit in regulation ("putts per GIR"), evens things out a bit, but even this is flawed too. There is quite a difference between the average distance that players hit the ball from the hole and if they are extremely accurate iron players. For example if you consistently hit the ball closer than I do, and we have the same number of putts, I am probably a better putter, but we will be equal in terms of putts per GIR. The reason I said above that you can now say definitively who is the best putter is that the statistical wizards at the PGA Tour have developed a method of calculating much more exactly how well the pros putt and who is the best. They call it Strokes Gained - Putting. It's calculated by comparing how many putts players convert from each distance of putt they encounter. The calculation relies on special cameras positioned by each green which records the distance each player putts from on each green. This is what's called ShotLink data. The statisticians work out over the course of the season who has performed best on the length of putts they had and rate them compared to the average for the whole PGA Tour membership, calculating how many shots each player has picked up (or dropped) over the average of the tour's performance. The calculation removes all external factors and compares only the contribution of putting. For example if you were the best player from tee to green and always hit your ball to 10 feet from the flag, your performance would be compared only with other players' putts from 10 feet, regardless of whether they followed an approach shot or a short game shot. How you got your ball to that point is irrelevant, all that counts is what percentage of your 10 footers you made, compared to the average for the rest of the field on putts from that distance. Basing the assessment of a player's putting on the length of the putts they have removes all possible bias and you end up with a clear judgement of who the best putter on the tour is. With these statistics, devised in 2011, it's now absolutely clear who has been the best putter of recent years ... and the lovely people at the PGA Tour have backdated their stats to 2004 too, so we can start to think about who has putted best over the longer term too.